An intelligence toy for all dogs, even beginners! It motivates your dog to think and solve the puzzles. 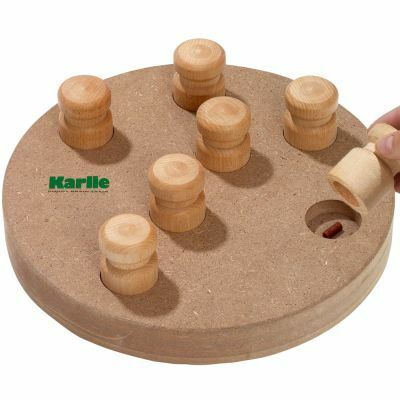 Choose between 2 wooden games to play with your dog! 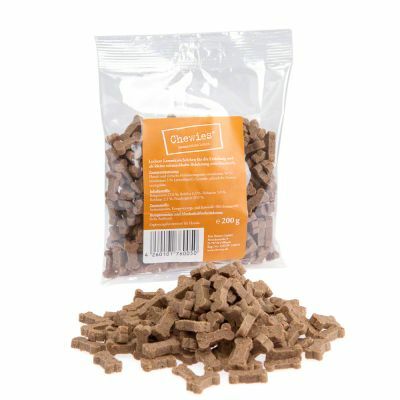 Easy but dog loves it :"Took my pup about 30 seconds to get the treats out but he still loves it. It's not as challenging as some of the other puzzle toys we have, but this one is his favourite. Added bonus is that he slows "
Challenge your dog! 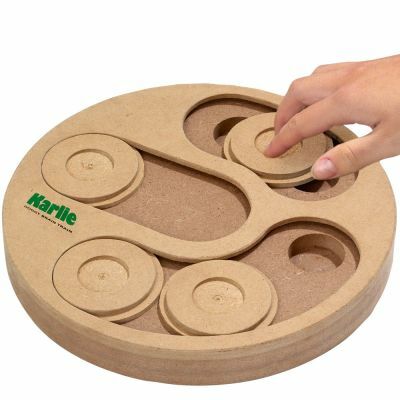 The Karlie Doggy Brain Train 2-in-1 Dog Intelligence Toy stimulates your dog to use its head and put its brain to work in order to get to the treat. Boost their intellectual performance through play and prevent the onset of boredom. With this cool soft wooden dog toy, you can enjoy two games in one. In the "sachet game", you hide tests under the game pieces and your dog has to find them. The "slider game" on the other hand work with the use of sliding pieces. 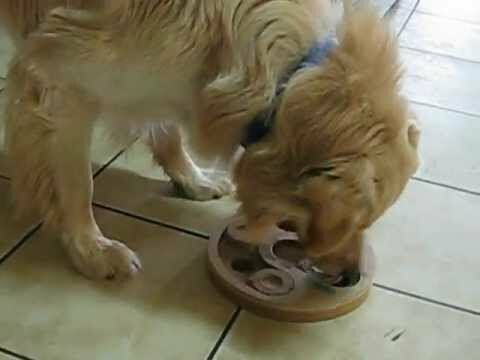 Your dog has to slide them to and fro to open up the round wooden holes to get to the treats. Playing with the Karlie Doggy Brain Train 2-in-1 Dog Intelligence Toy requires no prior knowledge on the part of your dog. Any dog can play along and increase their intellectual performance through play. Your pet is just to be highly motivated and to want to dive right in! 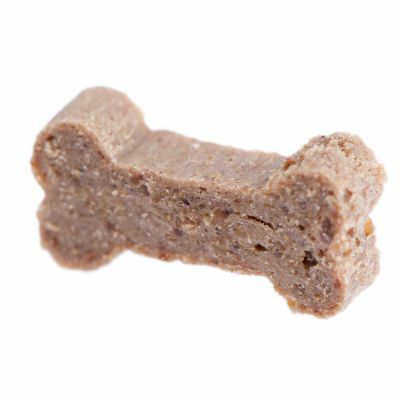 Why not try this dog toy with some delicious Chewies Bone Treats? The idea is great yet the quality is poor. 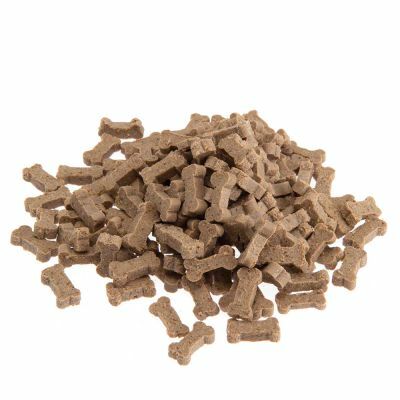 Mdf is used - this is not something you want your dogs to ingest and the product easily chips as they scratch or try to nibble to get to the food. Took my pup about 30 seconds to get the treats out but he still loves it. It's not as challenging as some of the other puzzle toys we have, but this one is his favourite. Added bonus is that he slows down when eating his food. Would recommend this as it's great value for two puzzles. My staffie x spaniel loves this toy. She knows how to find the treats, but still loves to play it. She would destroy it if we just left it out, so we put it away in between games. Good if she hasn't felt challenged enough in the day for tiring her little brain a bit! My Dobermans absolutely love this game. You are buying two in one as the games are completely different using both sides of the board. What a great idea! The product is sturdy and very safe. Will guarantee lots of game times for my dogs. Thank you. Good toy, but a bit too easy for my 1 year old lab, who took 8 mins to figure out how to work out the toy. Not great for value for money. I got this toy for my 6yr old standard schnauzer who is not usually the sharpest tool in the shed but she worked out both puzzles in under 90 seconds! Was hoping it would keep her entertained a bit longer than that. Not very challenging so not sure how useful this product is and question if value for money. My German Shepherd had this toy for a total of 2yrs before her teeth brought an end to it. She enjoyed the tasks and and I have to say she was too intelligent for it. It was too easy for her but she loved playing it again and again. She used her paws to slide the pieces of wood and her nose. And knocked over the egg cups to get the treats. I left my dog alone on one occasion and that is all it took for her to destroy the toy. Always supervise your dog and never leave them alone with this game. Bought this for our GSD pup, he loves it! even if it did take him two seconds to work out! it's well worth the money just to see how much fun he had with it. We bought a few Intelligence toys because our lively boxer had an operation on his cruciate and was housebound for weeks and very bored. Even though he worked them out quickly he loves doing them - or is that just because of the cheese and treats he finds! First time Bruno played the slider game, he bit the edges of the sliders to move them. With the edges chewed, the sliders can't slide, so couldn't use it again. Wood is too soft. Bought this for my miniature schnauzer's first birthday this week, he just loves it! In fact he was barking at it today to use it for his breakfast!! What a fun way to have your daily intake!! Great value for money, we will have this for a long time! We tend to get this out if its a rainy day and not very often as our dog does the sliders pretty quick as for the other side she picked up the plugs the other side of the puzzle straight away and ran away with them and chewed them , much too easy for her, but saying that she does enjoy doing the puzzle and receiving the treats hidden in it. I bought this for our 3 year old Staffie who solved both puzzles after 2 attempts. As a result when we put it in front of her now, she is not impressed as it's too easy for her. For the price I would have expected something a little more testing for clever dogs. Also scratched very badly, so not that sturdy for eager, stronger dogs. Melian, my 3 year old Lurcher, and Viggo, my 3 month old Bearded Collie, already had two brain training games. However none of them were teaching them to use their mouths. With this one they had no option but to pick up the wood cylinders which fit snuggly in the holes with their mouths as using their paws did not work or at least it took too much frantic effort to get them out. I had to do 2 or 3 demonstrations, picking up the cylinders with my mouth, and that was it, they got the hint; Melian carefully picks up the cylinders with her mouth and deposite them gently on the floor; Viggo grabs the cylinders with his mouth and throws them away. My Jack Russell hates the normal dog toys, she was always bored until I purchased for Christmas this amazing intelligence toy. She hasnt left it alone and her tail wags constantly while finding the treats. Great toy, would recommend this to all dog owners. We just got this today, meant to be for christmas but i couldn't wait. My Jack Russell loves it and got the hang of it quickly, i'm now going to try to teach him to put the little wooden cups in a tub when he takes them out. No interest from our lab though, lol.